Note: Changes are coming to OMA. A complete re-write is underway that will provide greater compatibility with newer Mac OS versions. Th current OMA was written using the Carbon framework, which is now deprecated. The new version is Cocoa-based and introduces a C++ image class, which allows easier implementation of new commands. The new app also runs in 64-bit mode, which provides performance enhancements. So far OMA2 doesn't have all of the commands of the current OMA, but more are being ported all the time. OMA2 will be available here. NEW: Compatible with Mac OS 10.9 (Mavericks), includes a plugin for viewing OMA files in coverflow. The acronym OMA stands for Optical Multi-channel Analyzer and is what Princeton Applied Research called their early SIT vidicon cameras. 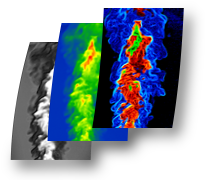 The OMA program was developed by researchers as a way to investigate and post-process photometric images from CCD detectors used for laser-based imaging of reacting and nonreacting flows as well as some spectroscopic applications. Originally written in assembly language on a PDP11 computer, the software has been around since the late 1970s. It has since grown on Classic Mac OS to be a very powerful image processing platform. Additionally, OMA is used in many labs as the front end interface for controlling I/O devices such as cameras, Digital I/O cards and stepper motors. OMA is a powerful control, acquisition and processing system for photometric images. This version has been updated to run under Mac OS X v10.4.x and to take advantage of new features in Mac OS X v10.5.x. OMA has been sold commercially for while at US$1000 per copy, but in this new initiative both the Application and the Source Code are being released to the research comunity under the Gnu Public License (GPL). It is hoped that this move will create and foster a community of OMA users who (in finding solutions to their own specific imaging needs) are able to contribute to the development of functionality within OMA. We encourage interested programmers to help implement future development directions and make suggestions. Display Photometric Images with false color-maps. Users can edit their own color-maps and load them into OMA. Save As pdf graphics files.Includes support for 3-plane images and TIFF imports. Group OMA commands into ASCII text files and execute them from within OMA. Generate batch files or create your own OMA processing short cuts. Macros can also have loops and simple arithmetic on image-derived values. Auto and cross-correlation Particle Image Velocimetry from particle image or image pairs. Fully transparent PIV process, centroid hunting, Multiple Peak hunting algorithm, outlier correction, etc. You control the processing! Read, store and manipulate 2D vector fields. Save fields as vector pdf files for publication. Import vector fields from text files. Convert between vector fields and OMA images and vice versa. Camera & Digital I/O Control Use your Hardware's Control Libraries to interface OMA to your equipment, then control timing, stepper motors and cameras using OMA for Data Acquisition AND Processing ! Read RAW, JPG, and TIFF image files from your digital camera. Windows? Linux? There is a version of the OMA program that operates under Xwindows, which makes the program available on Linux or even Windows machines. For instructions on getting OMA running on your Windows machine, check here. Web Design courtesy of Peter Kalt.